Question: I was diagnosed in 2008 with AA but I started losing my hair around 2005. I am still losing hair today. Due to the pattern that I am losing it, which is at the top in the “W” form like a male and also with diffused thinning all over, can I be helped without fake hair? I believe I have androgenetic, areata and ccc. Answer: Hi Dez, we very rarely advise using ‘fake hair’ to cover or disguise hair loss as, in many cases, this approach can actually make the problem worse. It is absolutely possible to have two or more hair loss conditions simultaneously, including Alopecia Areata, Pattern Hair Loss and Chronic Telogen Effluvium, Traction Alopecia or Central Centrifugal Alopecia. Alopecia Areata will display as patchy hairloss anywhere on the scalp, with bald spots or rounded patches often appearing suddenly. This is an autoimmune disorder and in some cases can clear up naturally, though alopecia areata treatment may help to speed this regrowth progress along. This form of hair loss may reoccur though if or when is impossible to predict. Female pattern hair loss causes thinning hair along the top of the scalp and at the temples. It differs from male pattern baldness in that the areas affected are less defined. Men tend to experience a receding hairline and thinning crown which may link up to form a balding strip along the top of their head, whereas women’s hair tends to thin more generally along the vertex and rarely results in baldness. This is the reason the condition is referred to as female pattern hairloss rather than ‘female pattern baldness‘. This is a permanent, hereditary condition that requires on-going management to prevent the thinning hair it leads to. A female pattern hair loss treatment course can offer the chance to stabilise existing shedding and promote hair regrowth. 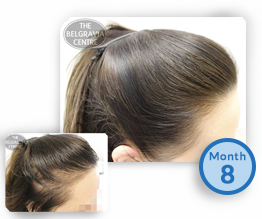 Chronic Telogen Effluvium is also known as ‘Diffuse Thinning’ and is a temporary form of hair loss. It affects the whole scalp and causes thinning hair which, though it may appear to come on suddenly, is actually triggered around three months before the hair fall becomes noticeable. Often this condition is caused by a shock to the body, generally brought about by issues such as stress, an underlying – sometimes undiagnosed – illness or dietary imbalance, or as a reaction to the body adjusting to new medication. Whilst this tends to last for a minimum of six months, it is not permanent and treatment can be stopped once the hair growth has normalised. For those with an active genetic predisposition to female pattern hair loss, however, telogen effluvium can exacerbate or trigger the early onset of this condition. 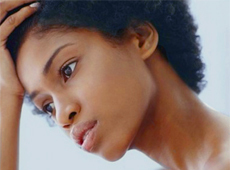 Traction Alopecia is becoming increasingly common due to the popularisation of the hairstyles which cause this entirely preventable hair loss condition. It occurs when too much strain is placed on the hair follicles, causing them to weaken. If it gets to the point where the follicles are destroyed completely, this will lead to areas of permanent baldness which cannot be treated except for, in some cases, via hair restoration surgery. Traction Alopecia can be avoided by wearing the hair naturally and loosely as often as possible and not wearing any tight hairstyles which place undue tension on the follicles too frequently. These include braids, high ponytails, buns and the use of all forms of hair extensions. 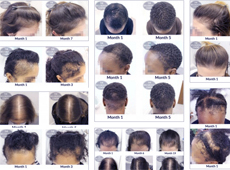 Should the damage have already been done – usually most visible at the front of the scalp in the form of a receding hairline as this area bears the brunt of the tension – then a custom Traction Alopecia treatment course can be useful in cases where the follicles are still active and capable of normal hair growth. Central centrifugal alopecia is considered synonymous with Follicular Degeneration Syndrome which is part of a group of hairloss conditions known as cicatricial alopecia or ‘scarring alopecia’. Whilst the majority of conditions in this group cause permanent baldness due to the follicles being severely damaged and scar tissue forming, CCA/FDS can sometimes be treated if caught in time. It displays as a specific and well-defined patch of diffuse hair loss on top of the scalp which then spreads outwards in a radial fashion, examples of which can be seen in our page regarding Treatment for Follicular Degeneration Syndrome. The key here is to have a professional diagnosis in order to establish precisely which conditions are at play. Once that has been ascertained, a bespoke hair loss treatment course, featuring proven medication and additional hair growth booster products tailored to your personal needs, can be devised to treat all these issues at once, where treatment is possible.